Warners Bay Bike path is the latest location in Australia to install a Automatic Bike Hire Station. The Automatic bike station is installed on Bike path Opposite shops. Helmets are available form Subway across the road. Its a trial so support this new initiative. Warners Bay Bike Hire is here thanks Lake Macquarie Council. Opposite Warner’s Bay shops, next to the crossing, the 4 bike station has unisex bikes for riders from 150cm tall, 2 with baskets and 2 with child seats.Hire prices range from $6.50 per hour for 4 hours or 12.50 for one hour. 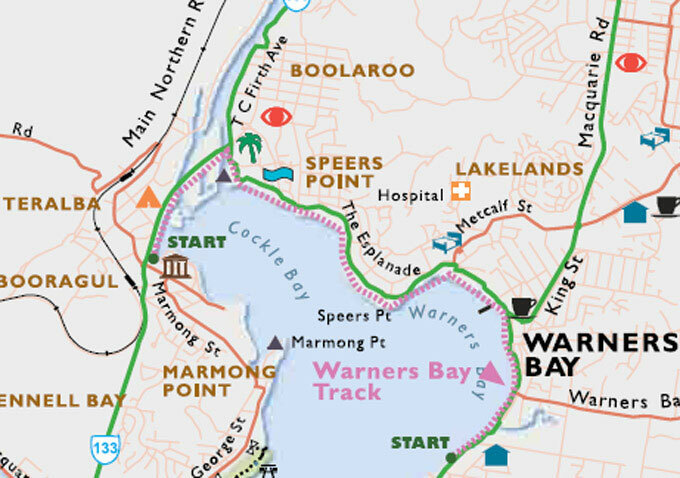 The area’s premier shared path is Warners Bay Foreshore. Well suited to a leisurely afternoon’s cycling, start at Warners Bay and make your way along the lake t taking in the spectacular Redbluff Boardwalk as you go. Take a break at Speers Point Park, grab a cup of coffee or a bite to eat for some extra energy. Any kids in tow will be delighted by a stop at the Lake Macquarie Variety Playground. Further along lies the Lake Macquarie City Art Gallery, marking the end of the path. Description: The premier pathway in Lake Macquarie, it hugs the Lake for its entirety. The path includes Redbluff Boardwalk, a 400m-long elevated boardwalk built over the water.